*Academic retreats are defined as a minimum of 10 or more paid Rocky conference attendees from the same school, staying in the conference hotel a minimum of two nights (single or double occupancy), and utilizing at least 5 sleeping rooms per night. All academic retreat offers noted above must be secured by November 9. JOIN OR RENEW NOW AND SAVE! Non-members and those whose ISCB memberships have expired will be able to join ISCB through the online conference registration system and immediately receive the member discount for Rocky '10. You can either join when you register for the conference or do so separately in advance here: www.iscb.org/iscb-membership. In order to qualify for the member discount, your ISCB membership must be paid in full. Those preferring to register at the non-member rate will immediately be offered a free 12-month ISCB membership with their higher fee. JOIN OR RENEW NOW AND SAVE! Non-members and those whose ISCB memberships have expired will be able to join ISCB through the online conference registration system and immediately receive the member discount for Rocky '10. You can either join when you register for the conference or do so separately in advance here: http://www.iscb.org/iscb-membership . In order to qualify for the member discount, your ISCB membership must be paid in full. Those preferring to register at the non-member rate will immediately be offered a free 12-month ISCB membership with their higher fee. noon on Thursday and Friday outside the meeting room. Lunches are $16 each. Vegetarian or Chicken Caesar Wrap sandwich, with sun chips, brownie, & bottled water or soda. Vegetable Chow Mein with apple, cookies, & bottled water or soda. Sold Out. Banquet tickets are no longer available. Radio frequency (RF) gate cards will be issued to all guests same as last year. . Please note there is a refundable $5 per ticket fee for the RF card; refunds will be given at the ticket counters. Tickets at Aspen ticket counter are $100 per day (non-group) on-site. Lift tickets purchased at advance Rocky group rate are non-refundable. (RMRBG) is gratefully accepted. If you choose, this contribution this will enroll you as a member of this group, and place you on the group mailing list for networking opportunities and announcements about future Rocky conference. The Silvertree Hotel is located in Snowmass Village, thirty feet from the Snowmass Conference Center and is on the Snowmass Village Mall and Fanny Hill, which has more than fifty shops, boutiques, and restaurants and is the hub for many exciting activities. Fanny Hill offers direct access to ski lifts. Group Room Rates - PLEASE NOTE: Group discount rates are available until November 15, 2010 November 9, 2010. Please call the hotel directly (1-800-525-9402) to inquire if rooms are still available at the discount rate. Single/Double occupancy $92.00 per night. Extra person charge is $25 per person per night. Children under 12 stay free in parents' room. The hotel rates will be subject to all state, county and city taxes in effect at the time of the Rocky '10 meeting. Cut-off date to receive reduced group rate is November 15, 2010 November 9, 2010. After this date, rooms, if available, are at prevailing rates. December 04: Online registration is now closed. Onsite registration will open December 9 at 11:00 a.m. Registration forms are located here. November 18: Sold out. Banquet tickets are no longer available. Make your hotel reservations online. Click here. CEO and Chairman of the Board, SomaLogic, Inc.
Online registration is now closed. Onsite registration will open December 9 at 11:00 a.m. Registration forms are located here. 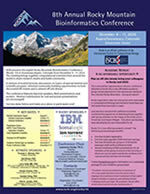 Welcome to the eighth annual Rocky Mountain Bioinformatics Conference, a meeting of the International Society for Computational Biology (ISCB). The organizers hope that you enjoy the program, and find the conference a productive opportunity to meet researchers, students and industrial users of bioinformatics technology. The Rocky series began eight years ago as a regional conference, and has grown into an international program with a spotlight on regional development in the computational biosciences. The presenters of the Rocky conference are scientists representing a broad spectrum of universities, industrial enterprises, government laboratories, and medical libraries from around the world. The meeting is a chance to get to know your colleagues near and far, seek collaborative opportunities, and find synergies that can drive our field forward. This was my first time attending the meeting. I was very dubious about the 10 minute talks. I was completely wrong. The talks were great. The conference was very well organized. Really, really enjoyed the keynotes this year - great mix, great speakers. As always, wonderful meeting in a great location. It is an excellent mix of different areas of science and a great way to meet new people. See you next year too. As a student who was originally trained in the biological sciences, it was simply delightful to meet many computational biologists, statisticians and computer scientists who are actively designing the tools on which I rely very heavily to do my work. I received good feedback, suggestions, and advice on how to move my current project forward. The suggestions on how to publish my data were also quite welcomed and I am most grateful. I look forward to attending the conference next year and hopefully doing so with novel data. Thank you. This has been a great conference. I look forward to attending next year.